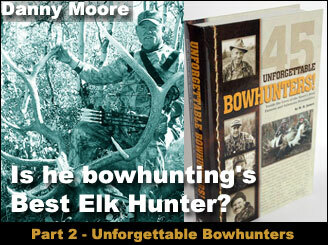 Second, of four excerpts from the book "Unforgettable Bowhunters"
Is Danny Moore Bowhunting's Best Elk Hunter? SOME BOWHUNTERS WILL ARGUE that he’s the best elk hunter alive. That’s debatable, of course, because Chuck Adams, Randy Ulmer and a handful of others are pretty fair elk hunters, too. Regardless, one fact can’t be argued: Montana bowhunter Danny Moore is one of the most consistently successful elk hunters to ever bugle up a rutting bull. 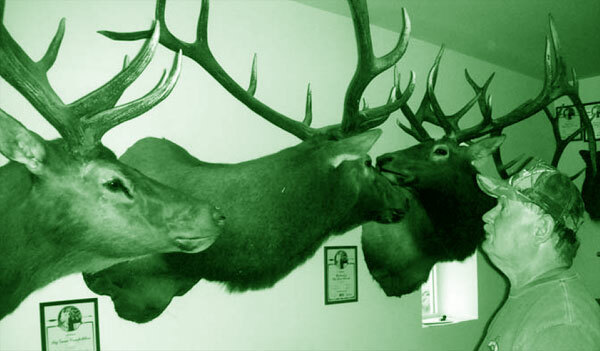 Danny Moore is one of the most consistently successful elk hunters alive. A self-taught hunter and bugler who hunts on his own, the Montana resident has killed more than 40 bulls in a row and today hunts only Pope & Young Club record book elk. This is a photo of a Nevada bull he shot in 2005, one of three trophy bulls killed that year. When the California native moved to Missoula in 1972, Big Dan had never seen or heard a Big Sky bull. To say that he was a greenhorn elk hunter would be a gracious understatement. But somehow he managed to arrow a cow elk the very next season. And the next. And the next. And the next. And the next. All five cows were tagged on the very same mountain near the city of Butte. Then, in his sixth Montana hunting season, Danny Moore killed his first bull. Although he didn’t know it at the time, tagging that antlered elk started his remarkable run of 43 bulls in a row. Year after year. Season after season. And 16 of his 43 bulls are entered in the Pope & Young Club records. “Fifty elk,” Danny Moore says without hesitation. SPEAKING OF NUMBERS, 2005 was a true dream season for the man nicknamed “Animal” by some of his friends. In addition to buying his usual over-the-counter Montana elk tag, he applied for and drew nonresident elk licenses in Nevada and Arizona. It would be a year that Big Dan would never forget. Starting September in Nevada’s Table Mountain Wilderness – where elk tags for out-of-staters are as rare as 430-inch bulls – Danny’s biggest problem was too many elk. Hundreds of elk. And while each challenging bugle brought herd bulls running his way, surrounding them were hordes of keen-eyed cows. As he explained, getting a shot was hard with all those wary eyes nearby. But finally on the third day of his public land bowhunt, he dropped a massive 5x5 bull that taped 321 6⁄8 Pope & Young Club inches. Next stop, Coconino County, Arizona. Arriving in the Flagstaff area just more than a week later, three short days before opening morning dawned in his assigned hunting unit, the savvy elkaholic started checking things out. But he didn’t see a single elk during his pre-season scouting trip. “Arizona elk don’t respond to bugles,” he’d been told. “You have to hunt water holes in this high, arid country if you want to get a good, close shot.” That was conventional Arizona elk wisdom that he heard repeated again and again. Big Dan briefly considered heading north to Montana and his favorite hunting haunts. But this was Ari-by gosh-zona, home of giant record book bulls. He shelved the nagging doubts and decided to hang around just to see what happened. It was a good choice. Driving through the predawn opening day darkness, Dan slowed as his truck’s headlights picked up a small-racked bull crossing the two-track just ahead. Hmmmmm.… This seemed to be as good a place as any to start hunting for that young elk’s big brother. Or his granddad! Big Dan parked, killed the engine and reached for his Bear compound bow. Soon a raghorn appeared, worked over a luckless pine tree and circled downwind. Danny simply watched the raghorn get a whiff of man-scent and crash away downhill. No problem. Several other bulls were still screaming nearby. “Time to check ’em out,” he thought and lifted his bugle again. This time three spikes trotted into view, pushed along by a smallish 6x6. Other bulls were still sounding off on the far side of the ridge. So Danny eased higher and topped out just in time to see a big-racked bull moving off maybe 150 yards away. A hasty bugle caused the departing bull to spin and head Dan’s way on a dead run. 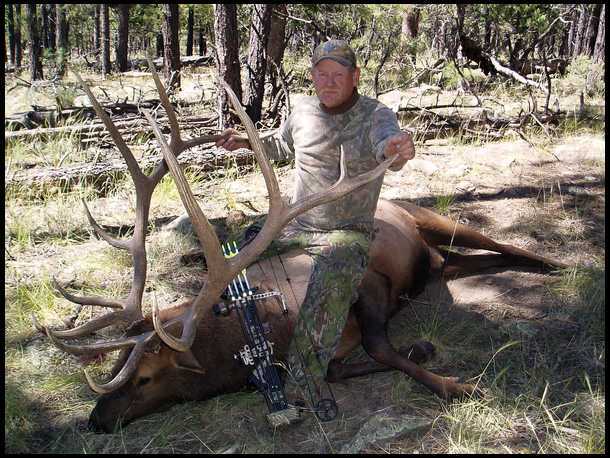 “I’ve never seen more aggressive elk than those Arizona bulls,” Big Dan remembers. “That large ol’ guy stopped about 35 yards away to demolish a pine. I could see he was a definite shooter, likely bigger than any elk I’d ever tagged, so I bugled again. He trotted right in. I shot him at 10 yards and then watched him go down in a heap about 50 yards away. Months later official Pope & Young Club scorer Ron Nail would prove Danny Moore’s initial guesstimate a wee bit conservative. That Arizona monarch’s gross score turned out to be a fraction over 400 inches. Even after antler deductions were subtracted, the huge rack still stretched the measuring tape to a whopping 3857⁄8 inches! 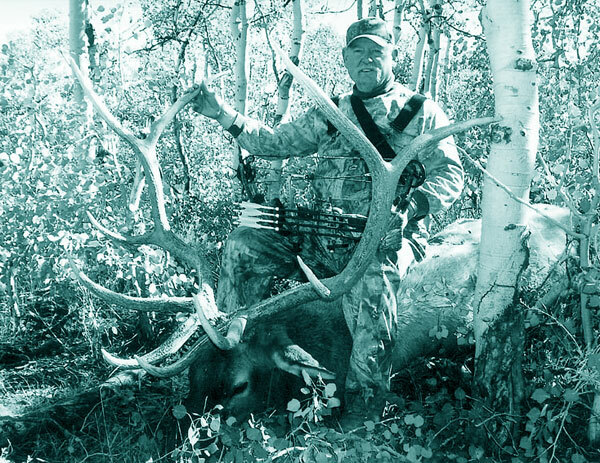 Oh, yes, in early October of that same magical 2005 season, Big Dan arrowed yet another Montana record book bull while hunting the Missouri Breaks. That third bull scored 2793⁄8 inches, nearly 20 inches above the Pope & Young Club minimum. Talk about the perfect ending to an unforgettable dream season. Scouting and hunting on his own, without the benefit of a guide, he’d just gone three for three, completing an elk season’s version of a hockey game’s hat trick. WHAT ACCOUNTS FOR SUCH amazingly consistent bowhunting success? Shooting ability and familiarity with bows and arrows, for sure. No problem there. 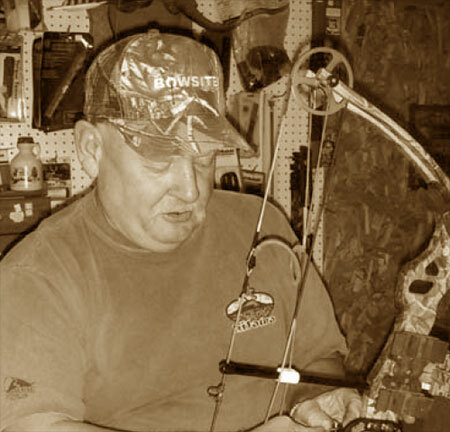 Danny Moore has owned and operated Big Sky Archery in Kalispell since 1976. And when you mix in years of trial and error elk hunting experience with his self-taught bugling technique, you’ve got a true triple-threat bowhunter. Ask about his personal elk calling methods and you’ll discover that Big Dan isn’t bashful about telling what works and what doesn’t. For one thing, he never uses cow calls. “Remember, I’m hunting mature herd bulls with at least five to six points on each side of their rack,” he says. “I don’t want to call in satellite bulls or cows. That’s why I stick with my bugle. Why would I do anything different? “After calling and locating a bull I want, I typically shut up and try to slip in as close as possible. No noise. No cow calls. Nothing. And when I’m as close as I can get, I bugle like the biggest, baddest bull on the mountain. If that doesn’t bring the herd bull hurrying to defend his cows, nothing will. ELK AREN’T THE SOLE objects of Big Dan’s bowhunting passion. He’s tagged and entered 13 Sitka blacktail bucks in the Pope & Young Club records. One buck topped the existing world record at the time that it was killed, but another bowhunter tagged an even larger buck before the next P&Y convention. Mention Alaska and bears and Danny Moore’s eyes sparkle. For the past decade and a half he and several friends have spent each spring on Prince of Wales Island where Big Dan owns an oceanfront hunting cabin. “We’ve killed more than 40 Pope & Young Club (black) bears up there, including half a dozen with skulls taping more than 21 inches,” he says. His best Alaskan black bear? A brute that officially taped 20 10⁄16 inches. That’s the best of 16 Pope & Young Club black bears credited to Danny Moore in the bowhunting record book. Other Pope & Young Club animals? There are a handful of whitetails and mule deer. Three mountain goats. Several pronghorn antelope and one Canada moose. Still, each September Big Dan turns his full attention to those rutty bulls waiting in the shadows of timbered pockets and brush-choked draws. As sure as the aspen leaves turn from green to gold, he’ll close his archery shop for the year, load his gear and head for some distant elk camp, anxious to discover what new adventure awaits him this new year. "The Book you absolutely can not put down!" 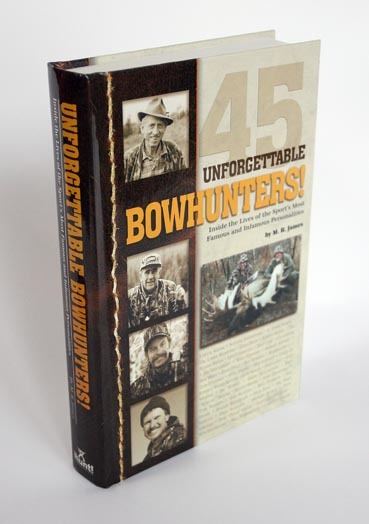 When MR James sent me a copy of his new book "Unforgettable Bowhunters" my first reaction was it was another book highlighting the hero's I knew all too well. What I discovered was a book that is an absolute must for every bowhunter's bookcase and one that I absolutely could not put down! Spotlighting the Good, the Great, and even the Worst bowhunters that ever lived. A candid, and brutally honest piece that will make you laugh, make you angry, and even scare the hell out of you. I have never recommended a book more than I do this one.